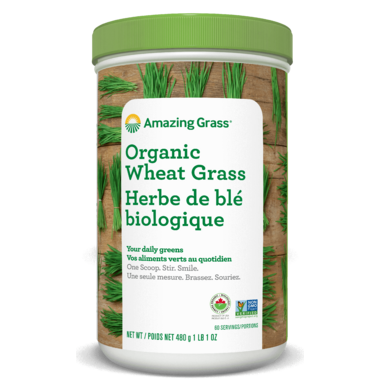 Amazing Grass Wheat Grass Powder contains 100% organic, whole leaf wheat grass, one of the most potent leafy greens available. 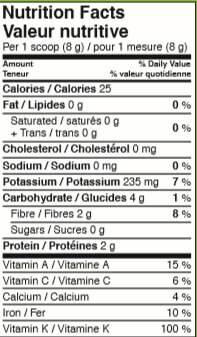 Amazing Grass Wheat Grass powder gives you an antioxidant packed boost that alkalizes and energizes with every serving. Just mix with any beverage for a great source of leafy greens, vitamins and minerals. In fact, you need only one glass to reach your daily quota of 5 to 9 servings of fruits and vegetables. Great product with straight wheatgrass. It is not something you would take in water but add it to something and you'll have a great shot of greens to get you going! 4 stars only because it can't be taken in water (the taste is a bit "plug and chug" if not mixed in something. Good product but be sure to mix well as there are clumps of dry powder that can be an unpleasant surprise. Great product and by far the best value for your money in the greens category. 60 servings for this price is great compared to most at only 30. This will be my second jar. Made the mistake of cutting the long handle on the scoop...not realizing I would need it half way through...oops. Always notice a difference in energy if I haven't taken it for a few days. Use it in smoothies. I love taking this. I have been taking 1 scoop per day in a glass of unsweetened grapefruit juice (I think the tartness helps it taste better) for 5 days so far & I feel really good! I do have more energy which is wonderful because I lack energy every single day! Great product! A wonderful product, great in smoothies, easy and convenient to use and I feel an immediate difference in my energy levels (more energy). Thanks for stocking this product! Love getting more greens this way. I immediately feel better when I drink it straight up. Wish that it didn't settle out so quickly in water though. Works much better in a smoothie. Highly recommend! Awesome product! Feel a lot better since i started taking this product a month ago. Much much more energy, excellent source of vitamins to kick start the day! My husband does not like to eat very many vegetables, so this is a really good alternative for him and his helath has never been better, since he has been taking this. I love this product it gives me my daily intake of fruits and vegetables and gives me a much need boost to my energy :) Thanks so much! Gives a kick to my morning smoothy. Love it! I like this product because it provides my daily quota of fruits and veggies. Tastes fine with water. I have not noticed a huge energy boost as some other reviewers did, but I am a high energy person anyways. I love this product. It does taste very grass like, but I put it in my juices every morning. I have been taking this for about 3 weeks now, and I really notice a difference. I feel like I have more energy and I just all around feel great. Excellent way to get greens..perfect in juice or a smoothie!